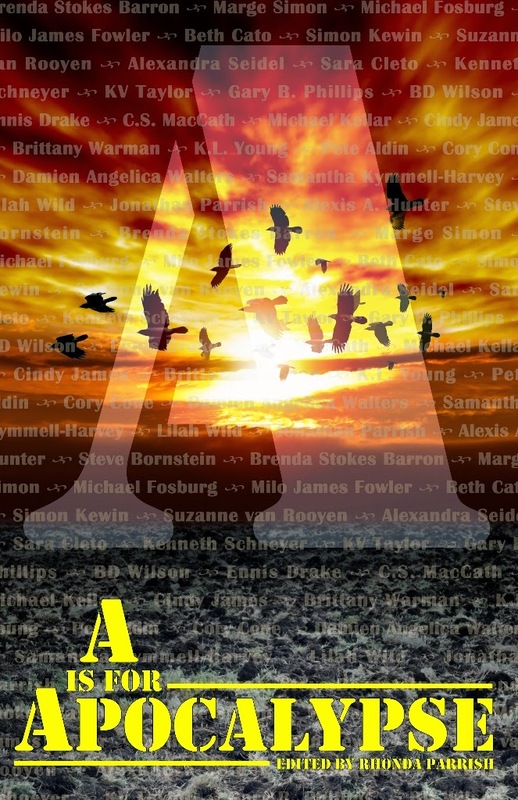 Welcome to the cover reveal for A is for Apocalypse, an anthology edited by Rhonda Parrish. To celebrate we have a Q&A for you with some of the contributors! Michael Kellar - "U is for REDACTED" got to me early on, and ended up being a perfect little glimpse of what would be important when facing the end of the world. Marge Simon - That’s really, really a hard question to answer. But I’m picking Damian Angelica Walters’ moving “U is for REDACTED”. It reminded me much of one of my top favorite dark sf stories, “Testament”. Sara Cleto - I'll admit that I haven't read through the entire anthology yet (it will be my reward when I finish this semester's grading! ), but I adore Brittany Warman's story- as always, her images are haunting, powerful, and full of wonderful folkloric resonances. Beth Cato - I loved R. It's one of the longer stories in the anthology, I think, and it's a unique take on events leading up to the apocalypse. The whole vibe is creepy and gritty. “Editor Rhonda Parrish gives us apocalyptic fiction at its finest. There's not a whimper to be heard amongst these twenty-six End of the World stories. A wonderful collection.” -Deborah Walker, Nature Futures author. Three ARC copies of A is for Apocalypse. These are physical copies but I am willing to ship them to anywhere in the world. The Rafflecopter draw will run from May 12th to May 19th. On May 20th I will choose three winners and email them in order to get their shipping address. Anyone who doesn’t respond by May 27th will forfeit their prize and I will choose a new winner to receive it.